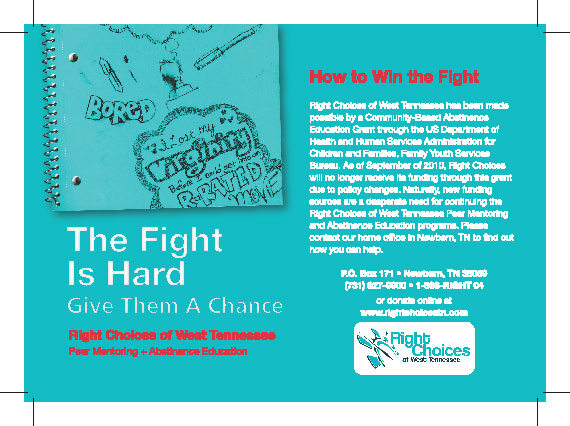 Right Choices of West Tennessee is an non-profit organization which educates high school students on the virtues of abstinence. To support fundraising efforts, I was asked to develop a series of promotional material informing prospective donors of the organization’s mission. I took the opportunity to think a bit outside of my normal approach to projects. First, I jotted down some startling statements that might communicate the seriousness of the pressures teens face everyday. Next, I went across the street to Dollar General and purchased a 5-pack of spiral notebooks. I began thinking of things I would write on my notebooks in high school and started to draw. After scanning the notebook covers, I started playing with color. There are times when a solid, flat color is just fun to start with. I found this dirty blue and decided on the bright orange color for the type. The brochure was the jumping off point. Various forms of the post card followed over the next month or so. This was a really fun project. 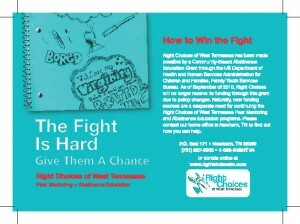 I hope to continue this campaign in the future.